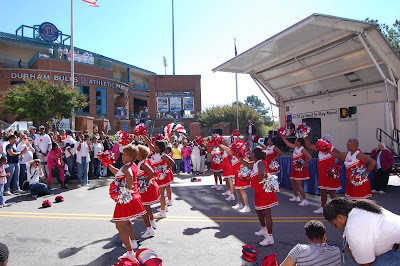 The Durham Bulls Athletic Park hosted Project Homeless Connect on October 8th. It might strike you as odd that we hold an event for homeless people in the ballpark, but the organizers attempt to create a festive atmosphere to draw folks in…to eliminate the stigma that goes with homelessness. And they aggregate about twenty service providers (medical, mental health, housing, benefits, employment, etc.) so it’s one-stop shopping. Another important feature: there are about as many volunteers as there are clients…lot’s of one-on-one attention vs. standing in long lines. A very worthwhile event! 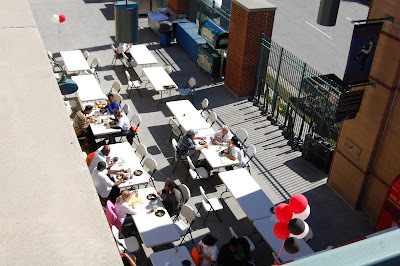 We were glad to host the event and feed everyone...went through 260 pounds on chicken in a couple of hours! Thanks to our CenterPlate food service manager Tammy Scott, the Interfaith Food Shuttle, Dillard's Barbecue and Durham Rescue Mission for helping to pull the gigantic buffet together. Note the festive atmosphere...thanks to the Durham Divas. 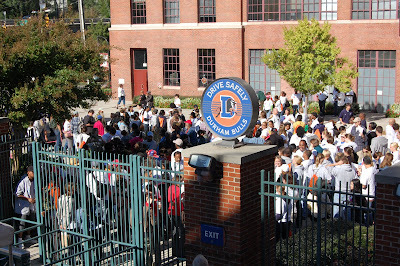 About 300 people registered for services, and there were approximately 300 volunteers. A client account from the Raleigh News & Observer: A veteran seeking permanent housing and help with his benefits had just finished a "slamming" piece of chocolate cake and said he was leaving with something he didn't come with. "A lot of hope." 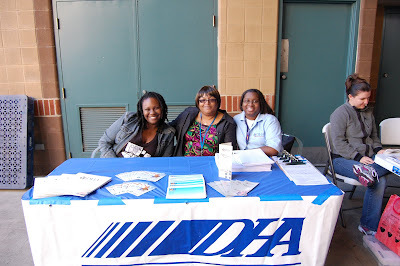 Smiling faces at the Durham Housing Authority booth. 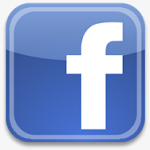 A volunteer quoted in the Durham Herald-Sun: "It just lets me know how privileged I really am. I have a house to sleep in every night. I have food on my table. I have transportation. I have a job to go to, and these people don't have any of that." That certainly sums it up for me.